Read here about tensegrity structures composed of 270 struts, part of a series of pages organized by strut count. Jim Leftwich posted details of his 270 strut model to the Well. It was constructed with wooden dowels and nylon thread. The colored hairbands wre added last, as an additional method to hold the nylon tendons in place. 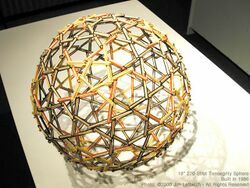 caption="270 strut tensegrity sphere by Jim Leftwich. 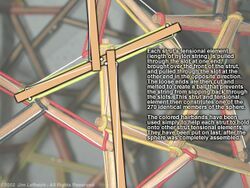 caption="Detail of tendon connections in Jim Leftwich's 270 strut tensegrity sphere. This page was last edited on 23 September 2018, at 12:29.